Do you have an Android phone? If so, you could be a little surprised to know that although Android is based on Linux, large parts of the Android operating system are also programmed in Java and most apps are made using the Java programming language. As is the case with most software that is used on the internet like web browsers, security software and Windows itself, the Java Runtime Environment (JRE) is updated at regular intervals as well. Java is no different to other software and needs bugs fixing, code optimizing and security vulnerabilities repaired from time to time. The problem has always been with Java, that when you install a new version, the older version it replaces does not get automatically uninstalled and you are left with more than one version on your system. This isn’t particularly good for security having the older versions still lingering on the computer, because they may have been replaced due to severe security issues.It’s not unusual to see several different Java versions still existing on the same machine and in some cases Java gets a bit confused with itself about which version it’s actually running, and in turn, this causes it to not function correctly. Then you have no option but to go through the removal process yourself to get rid of all the JavaRE installs. The latest release of the Java Runtime Environment is always supposed to be compatible with previous versions, but Oracle say it’s not a problem to keep older versions for maximum compatibility. This does though, seem to cause more problems than it solves by keeping them around in my experience, and it’s likely to be a better idea to remove them. A little utility to help you sort this out by removing the older and therefore redundant Java releases is JavaRa. One of the primary tasks of JavaRa is to make sure you have the latest version of the Java Runtime Environment installed. When you click on the “Search for Updates” button, you have the choice of trying to update using your installed JavaRE’s jucheck.exe updater tool, or via the Java website. The other main function of JavaRa is to purge the system of all old Java installation files leaving just the newest version. The “Remove older Versions” button does this and you will be showed a text log file on completion with information about what files and registry entries have been removed. This is obviously good for security, gives you a few Megabytes of free space, and removes some useless registry keys. Before you use this option, it is recommended to close any Internet Explorer windows currently open. There is an “Additional tasks” button which hosts a few other options such as removing the Java entry from the Windows startup, removing the Sun/Oracle download manager which is included in JRE, checking the current Java installed version, and removing the Internet Explorer Browser Helper Object etc. JavaRa is a small, portable and free utility that works with Windows XP, Windows Vista and Windows 7. Administrator privileges are required in Vista and 7 (right click, “Run as Administrator”). is it possible to run the tool in silent mode? this tool is marvelous, thanks a lot for the info. 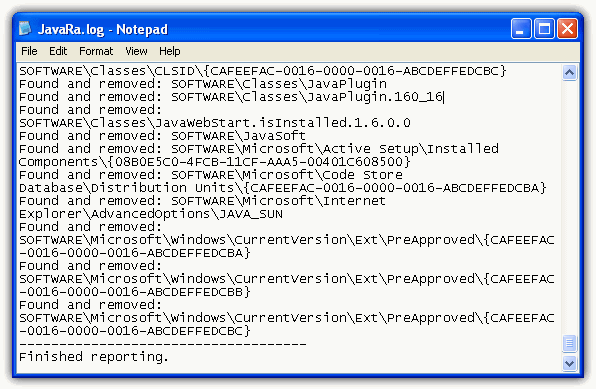 It is especially useful to remove old java versions, because of the vulnerabilities to malware. Raymond, you’re the man. Thanks for all that you do, I really mean it. Handy piece of software. I only had one old version left, but several temp files. I downloaded the latest version on Monday. And the program author is Paul Mc Lain. He can be found on Lunarsoft Forums. Nice find & thank you for sharing.